?Lily Has a New Home! Lily needs you! 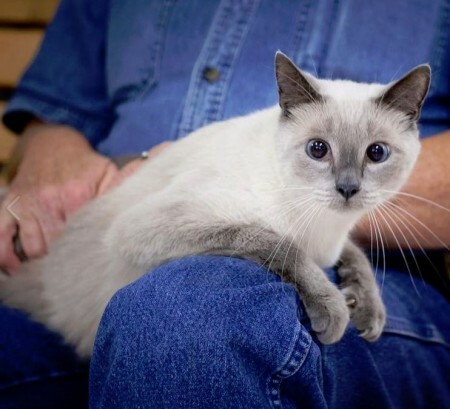 This beautiful little female Siamese cat is the beloved pet of a man who has been hospitalized with a terminal illness. It is his fondest wish that his pet be placed in a loving, forever home before he leaves this earth. ?Please help ease his mind in knowing that his cherished family member will be loved, kept safe and cared for after he is gone. Lily is very shy. She is not the kind of cat that likes to be picked up, but once she gets familiar in her surroundings and with you, she warms up and is quite friendly. Lily is a purebred Siamese with big, beautiful blue eyes. She is 4 years old, healthy, spayed and up to date on all of her shots. Her perfect home will be quiet and safe – preferably as an only pet – or with a quiet, cat-friendly dog. She is not a good choice for a home with young children. Lily is very clean and well-behaved. All she needs is a safe place to live, a window ledge to sit?upon, and someone to love her unconditionally.